The Cotswolds are a range of hills covering an area of 25 miles across and 90 miles long and lie mainly within the counties of Gloucestershire and Oxfordshire but extend into parts of Wiltshire, Somerset, Worcestershire and Warwickshire. The spine of the Cotswolds runs southwest to northeast through the six counties particularly Gloucestershire, west Oxfordshire and south western Warwickshire. The Cotswolds have been designated as the Cotswold Area of Outstanding Natural Beauty and is the largest AONB in England and Wales. The northern and western edges of the Cotswolds are marked by steep escarpments down to the Severn Valley and the Warwickshire Avon and this escarpment is often called the Cotswolds Edge. On the eastern boundary lies the city of Oxford and on the west is Stroud. To the southeast the upper reaches of the Thames Valley and towns such as Lechlade, Tetbury and Fairford mark the limit of this region and to the south the boundary reaches beyond Bath and towns such as Chipping Sodbury and Marshfield. The Cotswolds are characterised by attractive small towns and villages built of the underlying Cotswold stone, a yellow limestone, and drystone walls many built in the 18th and 19th centuries can be seen everywhere in the fields. The most well known towns or villages are Bourton-on-the-Water, Broadway, Burford, Chipping Norton, Cirencester, Moreton-in-Marsh, Northleach, Stow-on-the-Wold, Stroud and Winchcombe. During the 13th – 15th centuries the native Cotswold sheep were famous throughout Europe for their heavy fleeces and high quality of wool. Cotswold wool came at a high price and the wealth generated by the wool trade enabled wealthy traders to leave their mark by building fine houses and beautiful churches, known as “wool churches”. Today the sight of the sheep on the hillside is still one of the most common features of the Cotswolds. Worcestershire is a county steeped in history and boasts miles of The Great Outdoors across rolling countryside and winding waterways. It is a county of arts and culture as well as having many historic houses, museums, country house gardens, two arboreta and Britain’s premier steam railway. The villages of Church Enstone and Neat Enstone face each other across the River Glyme and are collectively called Enstone. Enstone along with the hamlets of Chalford, Cleveley, Fulwell, Gagingwell, Lidstone and Radford is the largest civil parish in Oxfordshire. Church Enstone houses a 17th century pub, the Crown Inn and a church St Kenelm’s. The earliest parts of the church are Norman but the building has been rebuilt in stages since the 12th century. St Kenelm’s is a Grade II listed building. The Prime Minister, Mrs Theresa May, spent her childhood in Church Enstone where her father Hubert Brasier was the Reverend at St Kenelm’s Church for twelve years. There are some lovely walks along the River Glyme including the Glyme Valley Way which is a 16 mile walk from Chipping Norton, following the path of the River Glyme, to Woodstock. The walk showing the rich history and value of the county’s countryside is a joint project between our Countryside Service and BBC Oxford as part of the celebrations for Oxfordshire’s 1000th birthday. It can be broken into smaller sections using public transport. We take the path on the left of St Kenelm’s Church. At the end of the path we come out into a field and keep heading forwards following the wire fence on our left. We go through the hedge line crossing over a stream then trough a gate. We keep heading forwards through the fields until we drop down into a deep dip. We turn left here through a gate then turn left along a lawned driveway. We follow the driveway past the golf course on the left then at Talbot Hall also on the left we drop off the driveway and keep heading forwards following the grassy path and the blue arrow through the hedge into the trees. We head forwards downhill and pass 3 NICHE ALCOVE on our right. We come out onto the golf couse and head forwards to a track. We turn left crossing over the tiny stream then immediate right through the posts uphill. We soon come to a gate we go through and follow the path through the fields. We come out at a lawned area and head forwards on the tarmac track towards the buildings turning right at the large stone and blue arrow. We continue forwards past the sheds on our left. At the end of the track we keep heading forwards into the trees following the track which turns left then right. Down below on our right we can see a fishing pond. We continue forward on the track with the hedge on our left. At the end of the hedge the track turns left passing Chalford Park to the road. We cross the road and take the track opposite sign posted Bridleway. When the track bears left at a building we head straight forward on the path. We cross over a tiny stream and follow the fence on our left uphill until we come to a stone path. We turn left keeping the golf course on our right. At the end of the golf course we go through a gate and turn left along a narrow path. The path soon splits we turn left through the iron gate, onto Shakespeare’s Way, following close to the River Glyme on our left. At the end of the field we turn left in front of a gate crossing over the river then immediate right through the gate. We head forwards and at the end of the field we go through the gate and turn right along the tarmac track to the farm. At the farm we turn left following the arrow between the buildings. At the far side we go through the small gate to the right of a large gate. We go through the next gate cross over the track to go through the gate opposite. We head towards the telegraph poles and go through the gate in the corner of the field. We turn left onto a track and head forwards following the hedge on the right. We go through another gate and head forwards through two more gates and follow the narrow path to Stone Farm. We follow the tarmac track then at the road we turn left downhill to the bottom crossing over the river and then turn right over the stile into the trees. We soon come out of the trees and head slightly uphill towards the corner of the wood in the distance. At the wood we head forwards through the hedge and follow the track with the wood on our right. At the end of the wood we keep heading forwards following the yellow arrow through the field. We come to the main road and cross straight over. We bear right cross over a track and go over the stile. We head forwards following the broad grass track to a t-junction. We turn right then left towards the trees. We go through the trees then head forwards through a field. We enter some more trees and follow the path down some steps with some buildings on our right. We come out at the lawned driveway again and cross straight over following the footpath sign. We follow the path downhill to a blue painted building we turn left and follow the track uphill back to Church Enstone. This is an easy walk on good paths and tracks and through fields. There are some inclines and declines. Elevation: Approx lowest point 125.30m (411ft) approx highest point 207.50m (680.77ft) approx ascent 199.70m (655.18ft). Approx 7.5 miles allow 2¾ to 3½ hours using OS Explorer Map 191 Banbury, Bicester & Chipping Norton. This walk is done anti-clockwise. Start point: St Kenelm’s Church at Church Enstone. Church Enstone near Chipping Norton in the Cotswolds, Gloucestershire. From the M40 take junction 11 and take the A422 towards Banbury. At the third roundabout take the first exit onto the A361 towards Chipping Norton. Take the left turn onto the B4022 bear right at the y-junction past Great Tew. At the staggered crossroads with the B4030 turn right into Church Enstone. Park at the side of the road or turn right into village for more roadside parking between the pub and church. Parking: free road side parking on the B4030 or near the pub or the church. There are no public toilets the nearest ones are Chipping Norton. For refreshments there is the village pub, The Crown Inn. 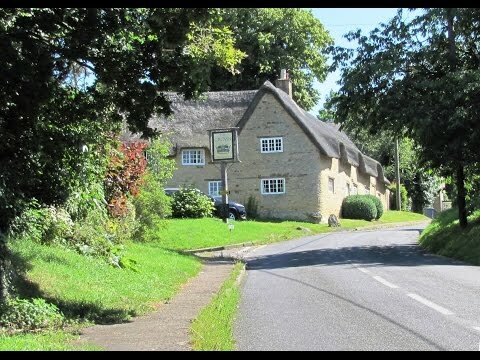 There is another pub which reopened as Artyard Cafe on a bend of the A44 at nearby Neat Enstone where there is also a post office and general store. There are more pubs and cafes at Chipping Norton.